The transition to fall brings a colorful set of decadent, soupy, warm dishes in place of crispy, fruity, cooler ones. Out with fresh tomatoes, in with canned. Out with apples off the tree, in with crab apple jelly. This may seem like a sad state of affairs, but I’ve been assured that it’s actually quite wonderful. Break out the cozy wool socks. Don’t go leafing. Someone will run you over with a tractor. I don’t care how old you are, carve a pumpkin. Eat at least one thing with cinnamon a day. Come up with 10 things to do with apples, because you’ll get at least that many a week in your share. Don’t be afraid of getting chubby. Winter bellies are a fabulous side effect of fall food (and an important precursor to hibernation). 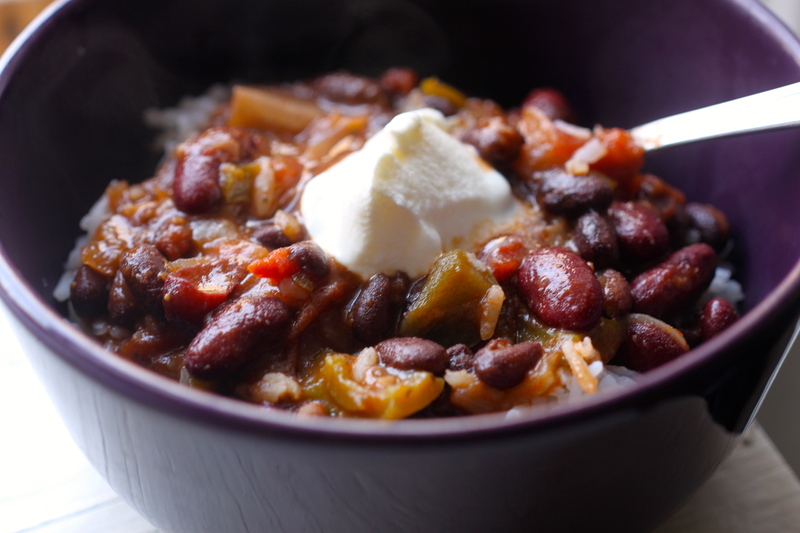 Keeping all this in mind, it is a ripe and delectable time for making and eating chili! We use a scrumptious vegetarian recipe from The Healthy Hedonist, which combines tomato, pepper, onions, garlic (all things we got in our share this week) with a variety of beans and mmm beer. I won’t give her recipe away entirely, as it seems unethical and illegal, but I strongly recommend giving it a try. If you’re feeling particularly corrupt, I suggest your chili with some cheddar, a dollop of sour cream, and clearly a side of corn bread. It is, after all, still corn season. Quite the belation! In case there was concern over the writer’s survival of Hurricane Irene – no need – crisis averted. Alive and well. Even our farm managed to endure! Since the monstrous tropical storm we all got walloped by, we had our concerns that most of our vegetables would be, well, soup. But they managed to survive beautifully, with few complications. When this week we accumulated heirloom shell beans, salad mix, edamame, corn, carrots, peppers, watermelon, apples, and grapes, dinner tonight was a very easy and delightful hodgepodge. 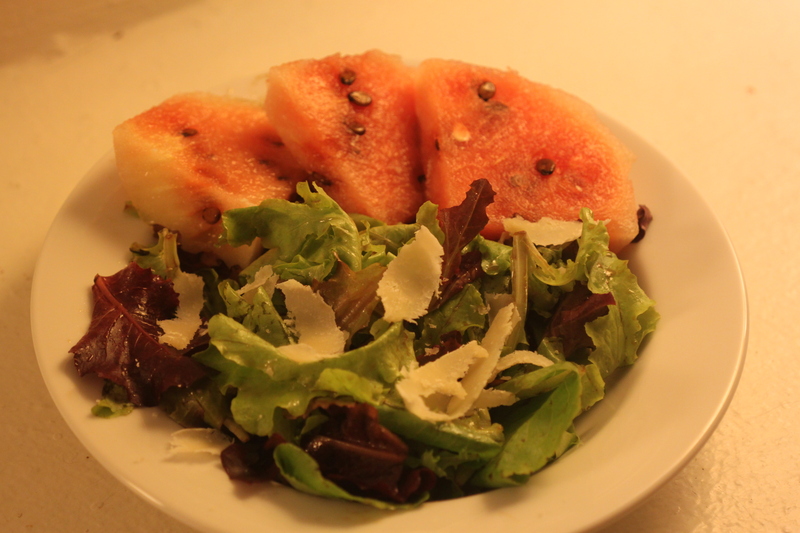 Like for instance, a mesclun salad with sliced watermelon and some local cheese? 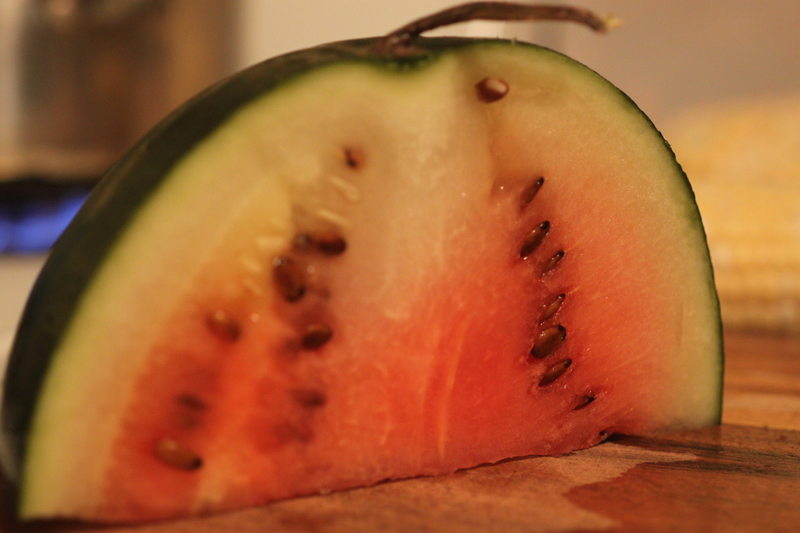 … I admit the seeds caused problems of the choking variety. Perhaps a plate of edamame and some corn on the cob? Or grapes and apples for dessert? Yes, I think so please. 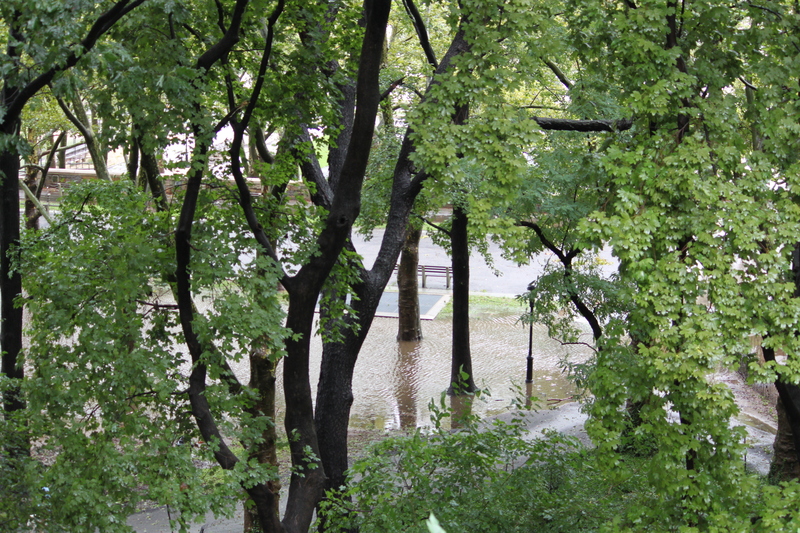 Meanwhile, although our farm might have endured righteously, look what Irene did to our park!